Akira Satake Performing. 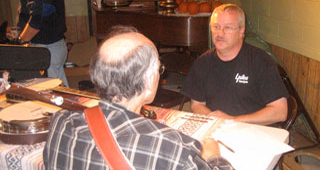 Warren Yates and Tim Gardner; two banjo makers talking shop. 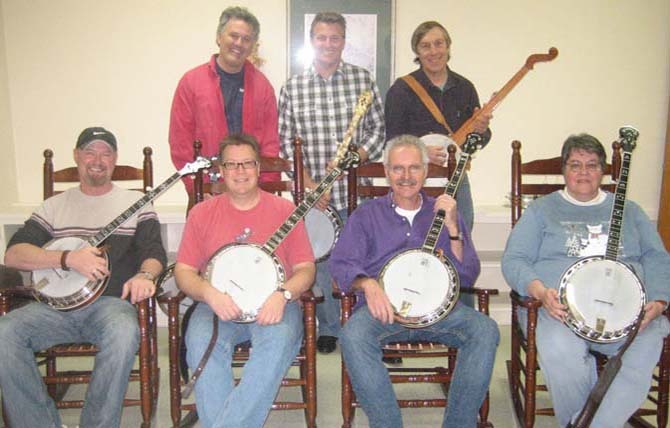 Marc Horowitz holding clawhammer court. Eric Ellis fielding a question. 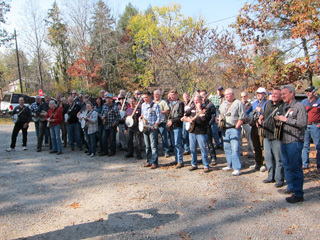 Tim Gardner discussing the fine points of open back banjo setup. 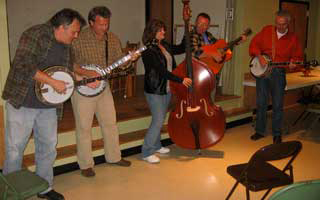 As Usual, Banjo Billy Hot on a Breakdown. Mike Scott explaining Magic at the 7th Fret. Marc translating Note-by-Note. Brandon tuning and teaching. "and they pay me to do this! Can you believe it?" "Yeah, I can, Donnie. 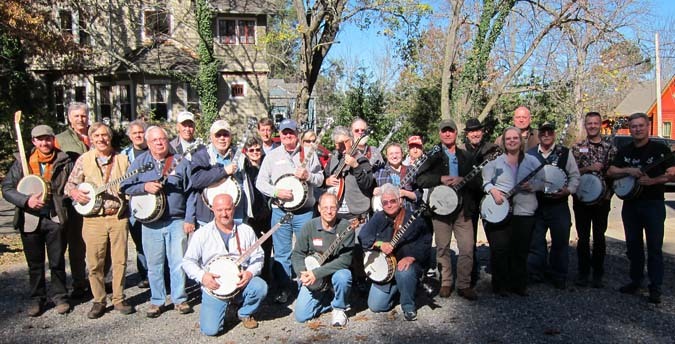 The North Carolina Banjo Clinic's a gas!" After discussing right hand intricacies, Mark Morris laying down a lick. Jack and Akira. Rob Bourassa taking a break from instructing serious theory. Donnie Little: Flatpicker Deluxe. 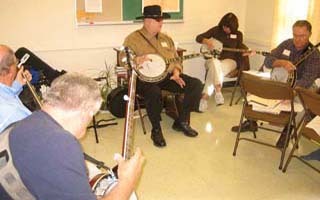 Mike Scott teaching advanced banjo. 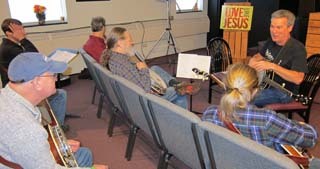 Jim teaching under our sponsor’s D’Addario banner. 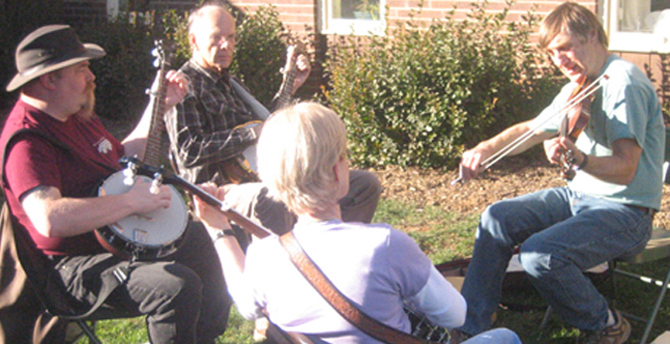 Hilary teaching clawhammer basics. 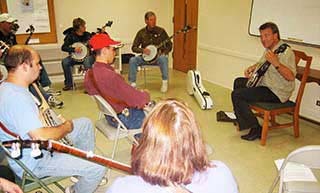 Wayne leading jam class. 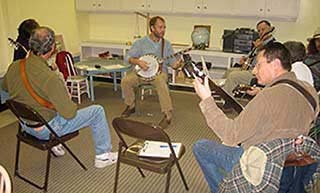 Jack Hatfield teaching techniques in melodic banjo. 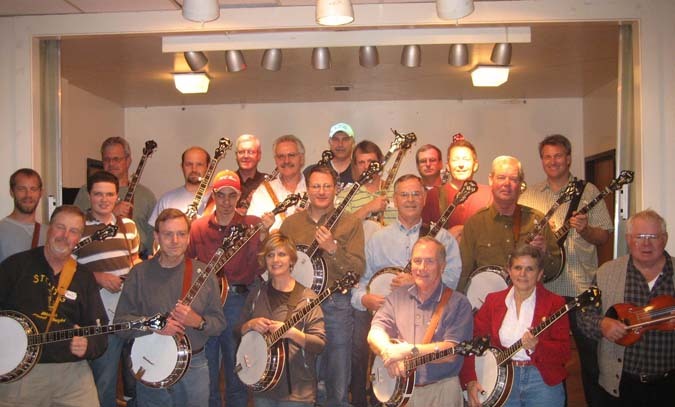 Bob Buckingham instructing advanced clawhammer banjo. Mike & Donnie cutting it up. After hours lesson with Jim. Another class photo, different angle. Tom McKinney breathing new life into another banjo. 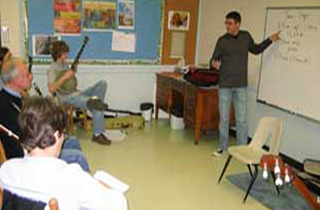 Jens Kruger teaching advanced banjo. 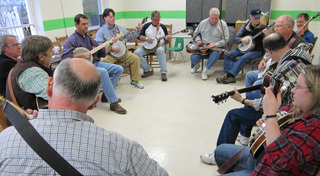 Jim Rollins leading an intermediate banjo class. 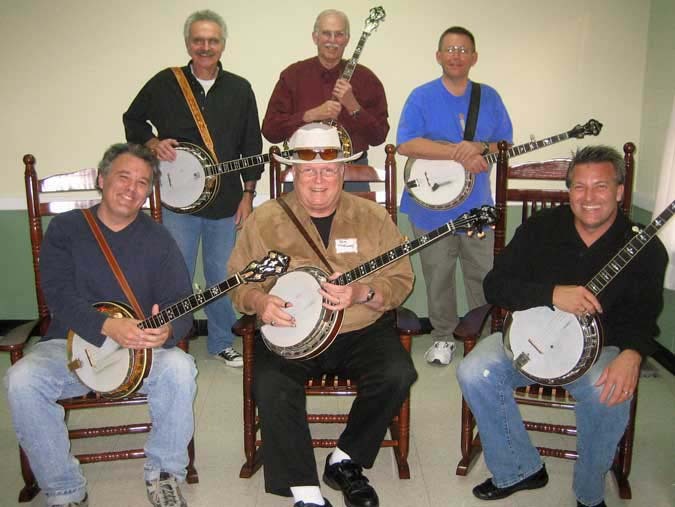 Warren Yates discussing banjo setup. 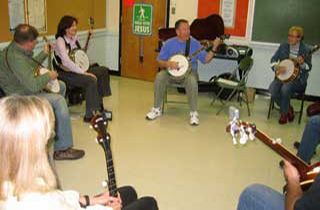 Bobby Anderson teaching beginning bluegrass banjo. 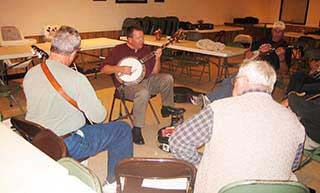 Gary Spence explaining novice banjo. 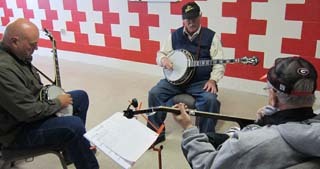 Donnie Little instructing the finer points of intermediate banjo. Wayne Erbsen taking a break from clawhammer and jamming on guitar. Mingling between classes. Instructors enjoying a sunny warm day on the famous Burnsville Square. 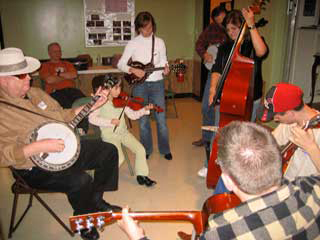 Rhonda Gouge teaching the mechanics of Novice Banjo. 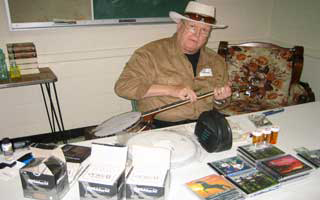 Warren Yates, of Yates Banjos, addressing a banjo setup question. 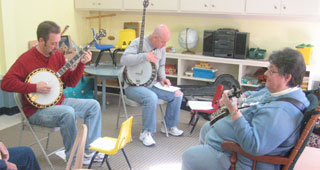 Don Wayne Reno and Ned Luberecki jointly teaching a solo improvisation class. 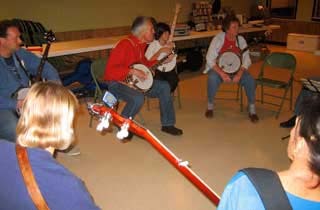 Old Time Jam with Wayne Erbsen. Bill Emerson with Mike Scott. 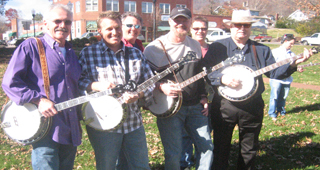 Cindy Baucom, Tom McKinney, and Tom Adams jamming. The 5 according to Tom McKinney. Terry Baucom fielding a question. 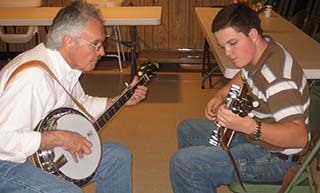 Tom Adams teaching the finer points of Beginner Banjo. Josh Goforth laying it down solid in black and white. Jim Rollins having his way with the Gold Rush. Tom McKinney trying to squeeze more tone out of a 5. 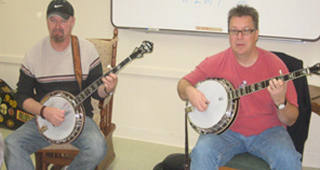 Graham Sharp of the Steep Canyon Rangers and Mike Scott instructing. 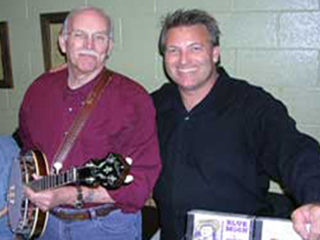 Tom Adams holding session and Terry Baucom teaching one-on-one. 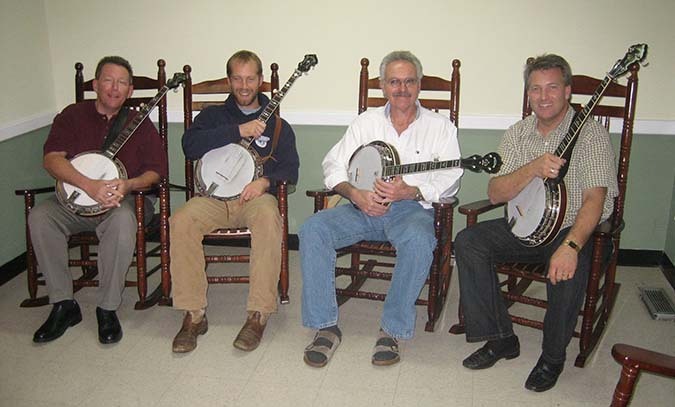 Our instructors, Tom Adams, Graham Sharp, Terry Baucom, and Mike Scott - all rockin' away. 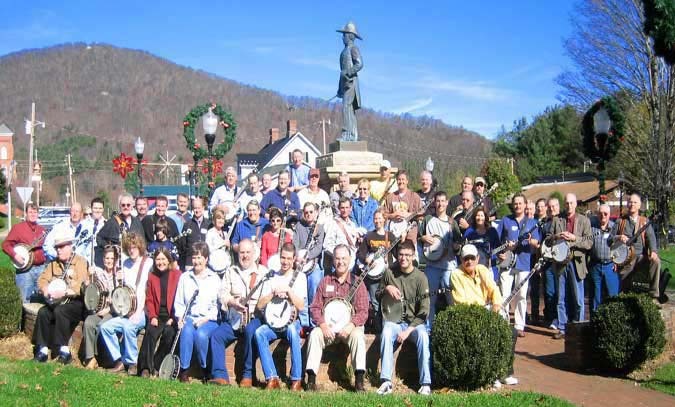 Come join us and reserve your spot in the 2011 NCBC class photo!